With our trailer back from the steel frame company it’s time for us to get cracking. For the first time during our tiny house adventure, we’re not waiting on any third parties anymore. Any potential progress is entirely up to us now. The first thing we have to do is wrap our shiny new frame in building paper. What kind of building paper are we using? For newbies like us choosing the right building paper wasn’t easy. There are all kinds of building wraps out there for all kinds of projects with all kinds of different properties. So it’s best to do some research beforehand and decide what you want from your building paper. 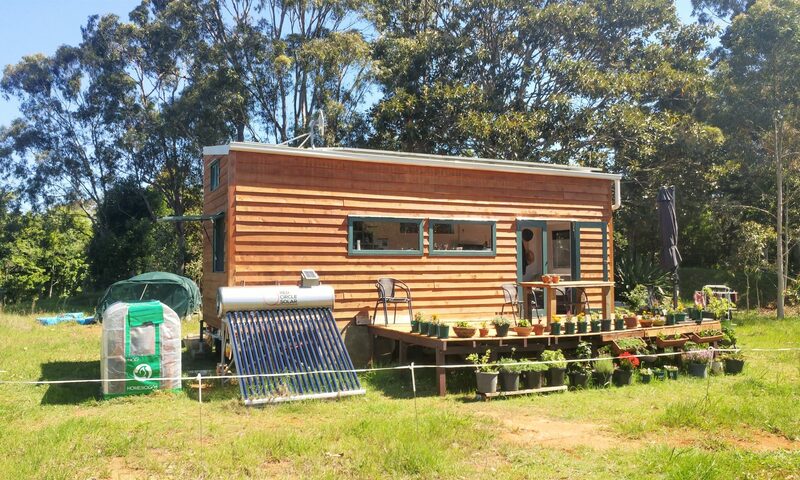 For us, it’s important that our tiny house is as energy efficient as possible. And since we’re living in a subtropical climate it’s crucial that heat is reflected back out during summer. After a little bit of research and talking to people we decided to go with Ametalin Silversark Extra R-value. It is a bit more expensive but has a high R-value. The R-value describes the thermal resistance level of the building materials, insulation materials, and reflective air spaces combined. A high R-value indicates a high thermal resistance and more effective insulation. We also thought that since our house is really small we wouldn’t need as much of it and therefore can spend a little bit more on the material. Another advantage of the Silversark wrap is its reflective insulation quality. Reflective insulation means that heat is reflected back in the direction it came from. In other words, heat will stay inside the house in winter and will be reflected back out during summer. Perfect! But in order to be effective, it has to be installed with a 20 mm gap between building paper and exterior cladding. 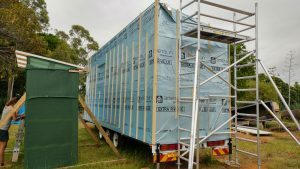 On top of that reflective insulation also reduces condensation in the building structure and provides a barrier against draft and dust penetration. 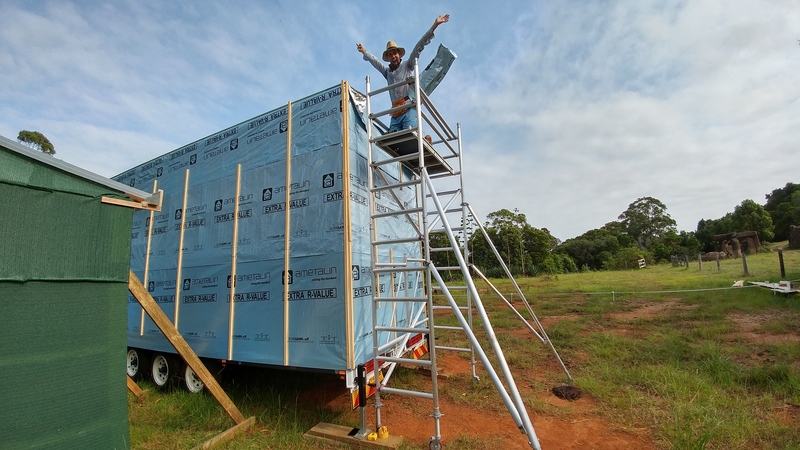 Great, so now that we have the perfect building wrap for our tiny house it’s time to install it. This is easier said than done. In hindsight, we should have just bought a whole lot of magnets. That way we could have made sure that the building paper stayed in place while we bolted on the battens. But we didn’t buy magnets. So we tried the double-sided tape. This would have worked nicely if it wasn’t for the strong winds on our build site which blew the paper right off. In the end, we did a combination of the magnet (we have one), double-sided tape (works great if there’s no wind) and me holding the paper reel while Paul was bolting it on. This method is more complicated and will give you a decent arm workout but we got the job done. What kind of cavity battens are we using? As mentioned before we had to create a ventilated gap in order to be able to reflect heat and reduce condensation. So we were looking for appropriate battens. We saw other tiny house builds online which used plastic cavity battens. They are very lightweight and even have gaps so any moisture can just run off and wind can go through the gaps in any direction. That would have been ideal since there’s very little chance for moisture to build up. Unfortunately, though we couldn’t find them anywhere in OZ and believe me we tried. So, in the end, we went with lightweight treated pine battens. They will do the job just fine. The matter of the screws has proofed to be a tricky one. Initially, we thought that we can just use the screws we’ve used for our floorboards since we’re going from the wood into metal. But the screws just sat loosely in the frame not doing anything. So don’t use wing tek screws! What we didn’t take into consideration here was the thickness of the steel frame. So be aware of that.